A lightweight steel frame with a squeeze grip handle for applying a range of caulks, sealants and fillers that are marketed in tubes. A large for of a caulking applicator that is used for applying chemical fastener. A mixture of a polyester base resin and hardener kept in separate compartments of a tube that are mixed together in a nozzle when they are extruded out of the tube. 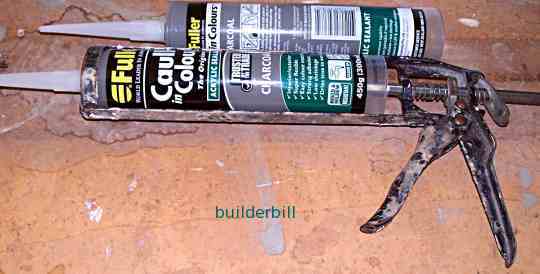 Using a caulker on top of skirting board. The material being applied will be a painter's acrylic sealer. This material skins over fairly quickly depending on the ambient temperature so it is advisable not to do too long a run before tidying it up with a damp cloth to make a nice concave bead. 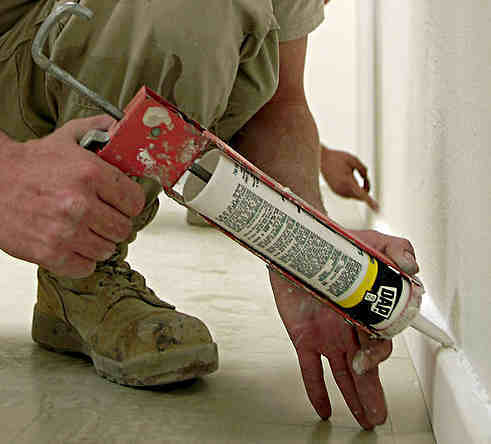 A standard cheap caulking applicator. They come in a couple of other sizes but this is by far the most popular one. Used for applying beads of sealer etc. The thickness of the extruded bead can be controlled by cutting more of less off the plastic nozzle. A Ramset, "Chemset" chemical fastener and it's applicator gun. A lot heavier and larger diameter than standard. Note that there are orange coloured spiral inserts in the nozzles to mix the resin and hardener. Also note the small orange stop valve and screw on cap at the front of the cartridge. The nozzles are throw away but material left in the cartridge can be used another day.